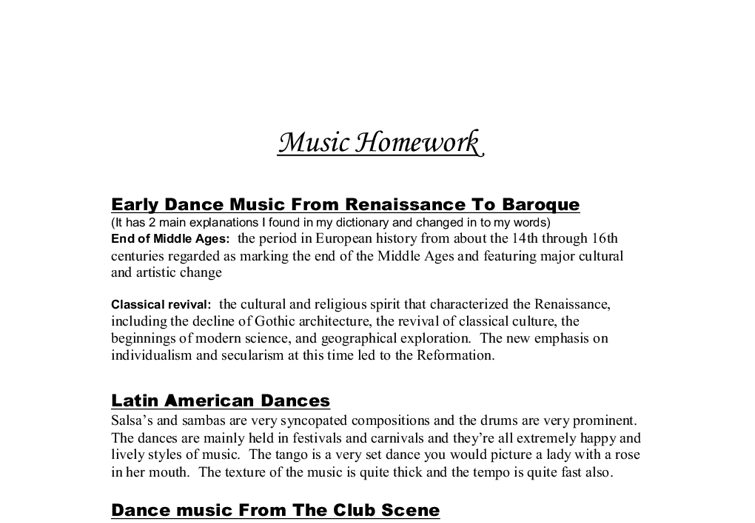 Music Homework Early Dance Music From Renaissance To Baroque (It has 2 main explanations I found in my dictionary and changed in to my words) End of Middle Ages: the period in European history from about the 14th through 16th centuries regarded as marking the end of the Middle Ages and featuring major cultural and artistic change Classical revival: the cultural and religious spirit that characterized the Renaissance, including the decline of Gothic architecture, the revival of classical culture, the beginnings of modern science, and geographical exploration. ...read more. The tango is a very set dance you would picture a lady with a rose in her mouth. The texture of the music is quite thick and the tempo is quite fast also. Dance music From The Club Scene Dj-ing is becoming very well known and extremely popular, almost enough to even overtake live shows with real bands. Dj-ing and sampling are used together a lot of the time and the main features used by a dj are a set of turntables or decks with vinyl records and a synthesizer. ...read more. There you can go into huge clubs and see some of the world's most famous dj's scratching at their decks. If you want to go out anywhere with your mates this is probably going to be the music played there. The dance style I would say is probably the most undefined and free style because wherever you are, there's a different style for this music. Hip-Hop started becoming famous in the 80's and has started to go slightly out of fashion now with lots of hot R n B artists appearing at every turn. ...read more. This student written piece of work is one of many that can be found in our AS and A Level Music section. Consider historically and critically a chosen genre of popular music - Rap music. A Grammy category was added for rap music in 1989, and D.J Jazzy Jeff and the Fresh Prince were the first winners of this for their single, "Parents Just Don't Understand." To further prove the point, Tone Loc became the first rapper ever to reach number one in the pop charts in 1989, with his single "Wild Thing." by Johann Sebastian Bach, 9. concerto grosso a. A composition for a small group of instrumental soloists and an orchestra. b. Bach's Brandenburg Concerto No. 6 in B Flat Major and Brandenburg Concerto No. 5, Handel's Concerto Grosso in G Major, and Vivaldi's Concerto Grosso in D Minor. What is the nature of employment in the music industry? Other advantages personally I think include a greater variety of work and potentially higher earnings, working from home and not having to travel and having greater control over the work done. So I think that Flexibility is a strong motivating factor for people who both run work and family responsibilities. one of many things ranging from laptops, mini disks, cd's, tapes, vinyl, mp3 players, phones. Then these devices would have to be amplified to an extent so that the audience can hear both the performer and backing track. Although if someone is an acoustic performer they would not use music technology as such but would be amplified. 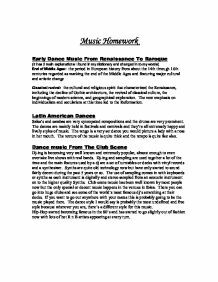 Evaluate the account of club culture offered by Thornton. By taking part in these cultures she states that participants are able to build a knowledge and belief in the norms of the crowd who partake in these gatherings. Stating that club cultures are faddish, fragmented and are heavily dependent on people being in the now, the 'hipness' is everything to club cultures. This incorporated a question and answer, where there is a four step sequence in which we are involved in a two and two combination and where actions include steps answered by arm gestures. The technique of 'question and answer' is an integral part of music composition. Looking for expert help with your Music work?